Home » Sleep » Can Music Help You Get a Good Night’s Sleep? Researchers have recently begun to explore what role music may play in helping people sleep. Several have even conducted meta-analyses to examine what research studies collectively say about music’s effectiveness as a sleep aid. Today we’re going to share the findings of one of these meta-analyses, which the International Journal of Nursing Studies recently published. This meta-analysis sought to measure how well music can alleviate acute and chronic sleep disorders by analyzing the results of ten published studies. These studies involved 557 adult participants with sleep disorders. In each study, participants were randomly assigned to a treatment condition, in which they passively listened to music, or an alternative condition. Researchers then measured the sleep quality of all participants. While the results of the meta-analysis are promising and suggest that music may help people sleep better, the writers caution that their research has a few limitations. For instance, although all of the included studies were randomized controlled trials, which are often considered the gold standard of research, many also had less rigorous design features, such as small sample sizes. [vii] Because of this, we need additional research to have conclusive evidence about music’s efficacy in enhancing sleep. However, as the authors of the meta-analysis observed, music didn’t negatively affect sleep quality in any of the studies, and it often costs relatively little compared to other interventions. [viii] Since music is an intervention with great potential to help and little potential to harm, people shouldn’t have any qualms about trying to use music to improve their sleep quality. Despite the need for further research, the preliminary evidence suggests that music may indeed be able to help you get a good night’s sleep. If you want to try using music as a sleep aid, we recommend using music similar to that used in the studies. While the genres of music in individual studies varied, each of the musical selections had a tempo between 60 and 80 BPM, a regular rhythm, low pitches, and tranquil melodies. [ix] Don’t forget to choose music that you enjoy as well! In a few weeks we’ll share a playlist of classical music with the above characteristics to help you sleep well. 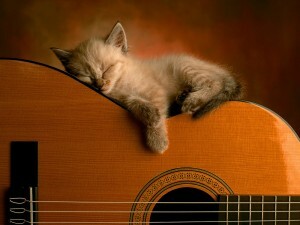 In the meantime, let us know if you have tried using music to sleep better. We’d love to hear your stories! [i] “Brain Basics: Understanding Sleep.” NIH: National Institute of Neurological Disorders and Stroke. National Institute of Neurological Disorders and Stroke, 5 Dec. 2013. Web. 7 Jan. 2014. [ii] “Consequences of Insufficient Sleep.” Healthy Sleep. The Division of Sleep Medicine at Harvard Medical School, 2008. Web. 7 Jan. 2014. [iii] Wang, Chun-Fang, Ying-Li Sun, and Hong-Xin Zang. “Music therapy improves sleep quality in acute and chronic sleep disorders: A meta-analysis of 10 randomized studies.” International Journal of Nursing Studies 51.1 (2014) : 51-62. Print. What if we’re playing soft and comfortable music, sometimes defined as smooth music. Does it affect our dreams? or anything in our mind at least? I’m not sure how music affects our dreams. That’s a great question and something to research more in the future! I’ve slept with music for about 7 years now. I do notice a difference between sleeping with or without music. Especially if I’m stressed out or when I have anxiety; it relaxes me in that way. I listen to soft rock, indie rock, reggae, Christian, jazz, classical, and sometimes country. If you’re thinking about trying it, I would highly suggest it, especially if you get anxiety or you’re stressed out. There are some good playlists for relaxing and sleeping on YouTube, or you can create your own playlists. I use music to sleep for many years now and for some reason music helps me fall to sleep faster and it doesn’t matter what type of music i put, if it’s music that i like it helps me to fall to sleep faster. I think that it depends on the person to kbow if music helps them sleep faster or not. Well thats my opinion anyway.